Specificity/Sensitivity: This antibody is specific for the amidated C-terminus of the peptide and does not react with GLP-1(7-37) (1). 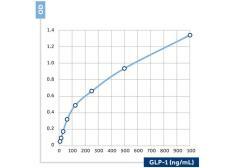 Specificity/Sensitivity: This antibody binds the free N-terminus of GLP-1(7-37) and GLP-1(7-36)amide and shows <0.2% cross-reactivity with GLP-1(9-36)amide, glucagon and human GIP. 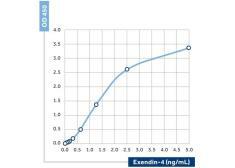 Cross-reacts 0.25% with GLP-1(1-37), approximately 6% with human GLP-2 and approximately 50% with exendin-4. this antibody cross-reacts with Liraglutide. Specificity/Sensitivity: This antibody binds the free N-terminus of GLP-1(7-37) and GLP-1(7-36)amide and shows <0.2% cross-reactivity with GLP-1(9-36)amide, glucagon and human GIP. Cross-reacts 0.25% with GLP-1(1-37), approximately 6% with human GLP-2 and approximately 50% with exendin-4. 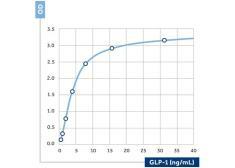 Specificity/Sensitivity: This antibody binds GLP-1(1-37), GLP-1(7-37) and GLP-1(9-37).Cross-reaction with C-terminally amidated GLP-1 is 0-16% in various circumstances. 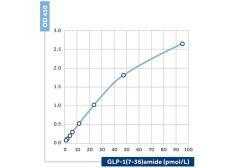 Specificity/Sensitivity: Reacts with all forms of GLP-1, including precursor and GLP-1(9-37) /GLP-1(9-36amide) metabolite this antibody cross-reacts with Liraglutide. 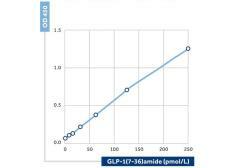 Specificity/Sensitivity: Reacts with all forms of GLP-1, including precursor and GLP-1(9-37) /GLP-1(9-36amide) metabolite this antibodycross-reacts with Liraglutide.